While growing up in Bogotá, the cosmopolitan capital city of Colombia, Constanza often sought refuge from the hectic city life at her aunt’s horse farm in the neighbouring countryside. 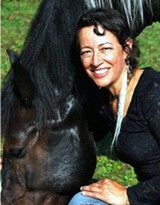 In the presence of horses, she experienced connectedness as the horses taught Constanza about the power of stillness and trust! When not in the peaceful surroundings of the farm, she would turn to the Arts to find expression and release to the many emotions she felt as a restless teenager. It was at that young age that the seeds of her lifelong dream took root; Constanza envisioned then a safe space where people can reconnect with Nature and themselves through the help of the Arts and the quiet, yet majestic, creatures…Horses. This vision guided her as she travelled to and from Colombia and Canada gathering the skills which would later assist her in realizing her childhood dream. Her enthusiasm for the Arts was further fueled with her being accepted into La Universidad Nacional de Colombia for their Visual Arts program. However, a tense political climate forced her to leave the country after completing her second semester there. Nevertheless, she continued her studies in Canada where she obtained an Honours degree in Visual Arts and an Honours Specialist degree in Visual Arts, both from the University of Guelph. She is also an O.C.A.D. (Ontario College of Art and Design) Honours graduate. While intensely curious and passionate about horses and the Arts, Constanza also loves to share and exchange her knowledge and experience with others, particularly the youth. So it is no surprise that she pursued and obtained a Bachelor of Education degree From Brock University and has been teaching in the public school system since graduating in 1998. Throughout her fulfilling journey as learner, artist, and teacher, horses have continued to guide her vision. Fortunately, Constanza never gave up on her childhood dream and has now extended her classroom into the round pen as a FEEL® Practitioner with her new equine partner, Shilo, at a private horse facility in Cambridge, Ontario. Constanza knows that these beautiful beings have so much to teach us, if we would only “Take time to slow down”. She has seen that, with the horse as a mentor and mirror, people gain the confidence to express their true and unique selves; thus experiencing for themselves the power of stillness and trust! Being a FEEL® Practitioner, with the horse as the teacher, allows Constanza to share the skills and experience she has gained over the course of her life. She now looks at helping people by supporting them through their personal development in a safe environment. Contact Constanza, today, to lead you to reconnect with Nature and to express your True Self, guided by the Arts and these magical and magnificent creatures. She can be reached by email at horses@rogers.com.